October is a month reserved for horror – what self-respecting repertory theater would deny its patrons the thrill of a good haunting, of blood-freezing terror, of a good old fashioned scare? Since the first reel of celluloid was projected onto a blank screen, movies have been terrifying us, dipping as often into the dark well of our nightmares as they have the glittering fountain of our dreams. There is a joy in being scared, in exorcising our real-world fears in the safety of the cinema, in the fantasy that only great scary movie can supply. We at the Roxy know that true cinephiles like their fearful fantasy rich and varied, which is why we’re offering a finely curated selection of ghoulish thrills to be enjoyed all throughout the month, guaranteed to put a Jack O’ Lantern-sized smile on your face. Let’s start with some classics, shall we? George R. Romero redefined the horror genre in 1968, gifting the world with the flesh-eating zombies we have come to know and love, and with his recent passing it only seems right to screen his original black and white masterpiece, Night of the Living Dead. If vampires are more your brand of undead, Vampyr and Nosferatu come to you with silent wings and sliver fangs, and Coppola’s sumptuous Bram Stoker’s Dracula waits to sate your bloodlust. In outer space, no one can hear you scream, but scream you will to Ridley Scott’s original symphony of science fiction terror Alien. 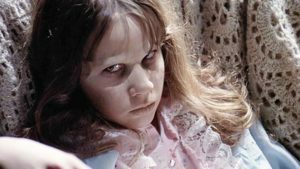 Evil hits closer to home with Stanley Kubrick’s impeccably crafted take on Stephen King’s The Shining, and hides in the girl next door in William Friedkin’s The Exorcist – still considered by many to be the scariest movie of all time. But surely nothing is more frightening than impending motherhood, a fear devilishly exploited in Roman Polanski’s sublime 60s masterwork Rosemary’s Baby. 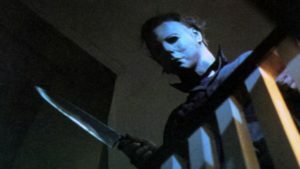 No proper Halloween should pass without a viewing of John Carpenter’s original Halloween, the ultimate exercise in terror and suspense that kicked off the great slasher wave of the 80’s, bringing fear to the suburbs. Knowing a good thing when he saw it, Sean S. Cunningham took the winning formula – and a pre-fame Kevin Bacon – to the campground with his franchise spawning Friday the 13th. As a bookend of sorts, Wes Craven and screenwriter Kevin Williamson cleverly re-invented the subgenre with Scream, a post-modern, self-referential blast that spawned a ghost-faced franchise of its own. Since then the post-modern slasher sub-genre has flourished, a great example being Jack Perez’s Some Guy Who Kills People, an indie splatter comedy that shows us the man behind the knife. Witches are a Halloween mainstay, and while Hocus Pocus takes a light approach to those of the cauldron and pointy hat, its charm – forgive the pun – is undeniable. A coastal island jaunt might seem equally as charming, but if you’ve ever seen the 70’s cult gem The Wicker Man you know that things don’t always go so well for those who intrude on the good Wiccan folk of such places. Darker still is Italian filmmaker Dario Argento’s take on witches, the Giallo-infused Suspiria, a dizzyingly art-directed, phantasmagoric nightmare with an unshakeable score courtesy of prog-rock masterminds Goblin. And if more Giallo is what you crave, Tenebre delivers with its expertly executed violence and suspense, proving why, in horror circles, Argento is known, rightfully, as “the Maestro”. The great filmmakers have always known that scares and laughter go hand and hand, that horror is just the flipside of the comedy coin. Shaun of the Dead made a name for director Edgar Wright and star Simon Pegg by honoring Romero’s zombie lore but tempering it with gut-busting – and gut-munching – laughs. Similarly Tim Burton made his bones with Beetlejuice, a hilarious riff on the haunted house trope that also minted superstars of Michael Keaton and Winona Ryder. Barry Sonnenfeld – along with the help of Raul Julia, Anjelica Huston and a young Christina Ricci – took up the mantle with his lively, laugh-heavy take on The Addams Family. And lastly but certainly not least we offer the ultimate horror comedy blockbuster – the original Ghostbusters. Who else you gonna call? So whether you’re out for screams, laughs or just a spooky good time, The Roxy has your tricks and/or treats covered this Halloween. Come out of the shadows and join us for a fright!